<align=”left”>Elegant Violin Clock – If you’re looking to make a great impression, you’ve just found the perfect gift! 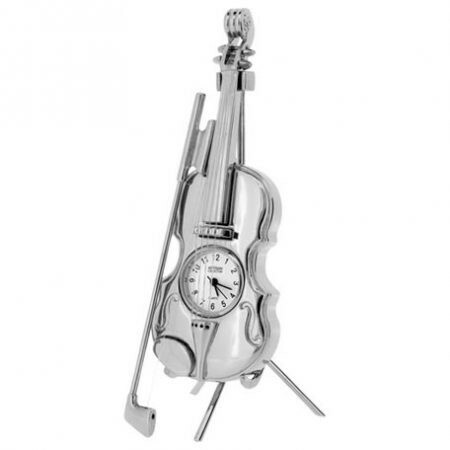 This beautiful, silver-plated violin clock stands statuesque and demands attention from anyone in the room. A wonderful conversation piece, this elegant clock makes a wonderful addition to your home decor. Stand and bow are included. Crafted with intricate detail including violin strings and ornamental etching! Whether they play in the symphony or “fiddle” around in a country band, this is the perfect gift for any violin player. Size approx. 4″ Long x 1.5″ Wide. Solid, sturdy construction. Battery included.